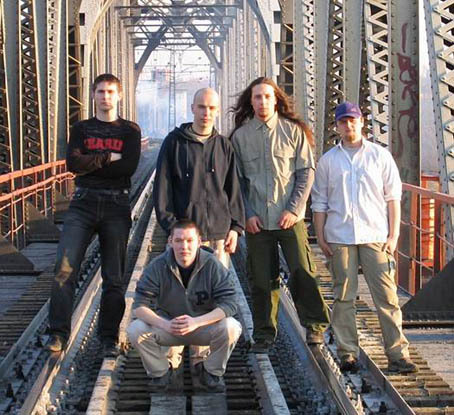 It was the long autumn of 2000 when Sergey decided to form a band in melodic-death style. In summes 2001 he met Alex Korovkin, who played the guitar. Now to form the band they were needed a drummer and Sergey invite his brother Anton who played in true-black band ETRNAL SIN to join them. In autumn of 2001 were made the first rehearsals. Later Alex brought his friend Anton Sakharov and the first songs that later were placed in a demo-album "Evidence" were made. In spring of 2002 the band begins to look for bass-player, they found Evgeniy Lobazov. In the 7th May the played their first concert in a rock-club "Partizan". In summer of 2002 the band began to make their first record - demo-album "Evidence" at Megabyle rec. The recording lasts for september and then another one song "The exit" was added. Demo "Evidence" became a big underground success and that gave a rise to the band´s assurance. In autumn 2002 - spring 2003 they recorded the new stuff and had some concerts in "Partizan". In june of 2003 Anton Sakharov and Evgeniy Lobazov choose not be a part of INEXIST any more. Two new members filled in the band, it were Evgeniy Artemiev and Alexandr Ruchkin, who left ETERNAL SIN band. In the august and november of 2003 the band played concerts in Moscow. In november they recorded two singles "Tapiola" and "Acoustic medley pt.2" at Megabyte rec. In the late january Sergey was invited as a session vocalist to famous black-death band Mind Eclipse and with him they recorded their 3rd album "Utopia:formula of god". In the late february INEXIST began to record their debut album "Am I Senseless ?" at Megabyte rec. It was done in may of 2004. In summer the band began to create a new suff. In the 1st of october 2004 the debut album "Am I Senseless ?" released on Stygian Crypt productions.